Though it’s tempting to kick back with a cool drink here in sunny Rotterdam, we’ve been working hard to improve your experience on Floorplanner. And last week, we released a big update to image exporting. And when we say big, we mean big: we’ve built an entirely new system to handle the generation of floor plan images. It’s much more efficient, and this means we can do some exciting new things – starting with making image exporting available to everyone. In the past, image exporting was only available to paid users of Floorplanner. But with the new system, users with Basic accounts can now export their floor plans to a 640x480 JPG file – perfect for your blog, Facebook profile, or Twitter. 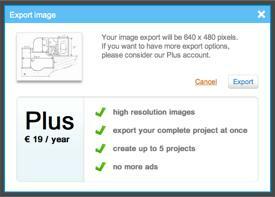 Users with Plus accounts will now find they can export images all the way up to 2100x2800 pixels in size, a little over double what was available prior to the update. This means that whereas previously exported images could be used as a modest desktop wallpaper, it’s now possible to export images that will look clean and crisp in print. Pro account users will see the most welcome changes, and for us, this is what the new system was built for. The first thing users will notice is that the new system is much faster, and far more stable. We hope that this alone will make an enormous difference to Pro account users’ experiences when exporting images. The second major difference is that image scaling has changed: whereas previously all designs in a project were resized to fit the image – making the scale of a large ground floor mismatch a smaller attic, for instance – now all designs are exported to the same scale, eliminating any confusion regarding mysteriously growing rooms. Finally, we’ve added image exporting to the Floorplanner API. This means that portals and users with API access can request an image of any design in any size they like, and it’s as simple as that. So we hope that you’ll find sharing and printing your floor plans easier than ever before, and we’ll be keeping you up to date with more improvements over the Summer.